Ryan Levy has been named managing shareholder at Patterson Intellectual Property Law. He also serves as the co-chair of the firm’s Litigation Practice Group. Levy focuses on intellectual property litigation with an emphasis on patent litigation. He has represented international and domestic companies as both plaintiff and defendant in matters involving chemical formulations and related properties; large-scale industrial equipment; processes for roadway design; automotive equipment; and various software ranging from web-based protocols to automated detection systems. Levy is a fellow of the American Bar Foundation, a fellow of the Nashville Bar Foundation and previously served as president of the Young Lawyers Division of the Nashville Bar Association. He is a member of the Tennessee Bar Association and a member and past president of the Tennessee Intellectual Property Law Association. He previously served as a Program Committee Chair and Executive Committee member for the Belmont University College of Law American Inns of Court. Levy earned his J.D. from Duke University School of Law in 2005. He graduated in 2001 from North Carolina State University with degrees in biochemistry and chemical engineering. He has been recognized as a Super Lawyers Rising Star 2013-17, and was presented with a Nashville Bar Association President’s Award in 2015. He has been with Patterson IP Law since 2005. 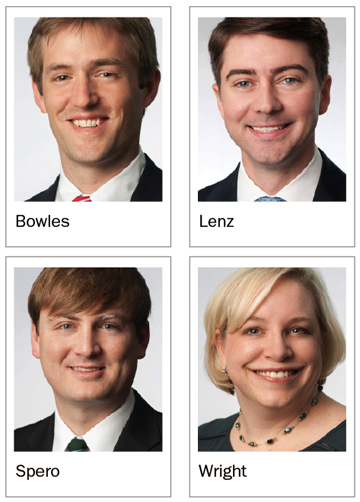 Christopher A. Bowles, Scott Lenz Jr., Frankie N. Spero and Heather Howell Wright have been elevated to partner at Bradley Arant Boult Cummings LLP. Bowles is a member of Bradley’s Real Estate Practice Group. He practices primarily in the areas of economic development, energy and environmental regulation. Bowles assists clients in obtaining incentives for job creation, capital investment and clean energy projects. Previously, he served as Nashville’s first-ever director of environment and sustainability for Mayor Karl Dean’s administration. Bowles earned his J.D. from Vanderbilt University Law School and his bachelor’s degree from the University of Wisconsin. Lenz is a member of the Healthcare Practice Group. He assists clients with a variety of transactional matters involving healthcare systems, hospitals, ambulatory surgery centers, imaging centers, clinics and physician groups. He received his J.D. from the University of Minnesota Law School and his bachelor’s degree from the University of Central Florida. Spero is a member of Bradley’s Litigation Practice Group. He focuses his practice in the areas of complex business, real estate, transportation and banking litigation. He is a graduate of the University of Tennessee at Chattanooga and earned his J.D. from the University of Memphis School of Law. Wright is a member of Bradley’s Litigation Practice Group. Her litigation practice involves a wide variety of commercial matters. Much of her practice is representing financial institutions and mortgage servicers in state and federal courts across the country. In addition, her practice involves real estate disputes, title disputes, breach of contract, breach of fiduciary duty, fraud and consumer protection violations. Wright is a graduate of Sewanee: The University of the South and earned her J.D. from Wake Forest University School of Law. William T. Cheek III, Robert D. Pinson, Olatayo O. “Tayo” Atanda and Kimberly Faye have joined Waller Lansden Dortch & Davis, LLP, bolstering the firm’s hospitality and retail practice in Nashville. Waller’s multi-disciplinary hospitality team services restaurants, hotels, craft breweries, and distilleries on a variety of legal issues by providing advice and representation on day-to-day operational, regulatory and strategic matters. Cheek is the only Tennessee attorney recognized by Best Lawyers in the category of Food and Beverage Law, and he authors the blog “Last Call,” which covers Tennessee alcohol, restaurant and hospitality news. Cheek provides advice and counsel to hotels, restaurants, arts venues, night clubs, sports facilities and other retailers on licensing and regulatory compliance issues related to liquor, beer, dance, catering and special event licensing throughout Tennessee. He is a founding member of the Alliance of Alcohol Industry Attorneys and Consultants and a member of the National Association of Alcoholic Beverage Licensing Attorneys and the National Conference of State Liquor Administrators. Cheek also advises startup businesses and emerging companies across a wide range of industries. He earned his J.D. in 1991 from Vanderbilt University Law School and his B.A. in 1986 from Columbia University. Pinson concentrates his alcoholic beverage legal practice on the manufacturing tier. He assists numerous distilleries, wineries and breweries across the United States with federal and state rules and regulations regarding advertising, marketing and commerce, and he works extensively with distilleries and breweries on licensing matters. Pinson has assisted with obtaining licenses for more than two-thirds of the distilleries in Tennessee, and he has licensed numerous distilleries, breweries and wineries in New York, California, Arkansas and Louisiana. Pinson formed the Tennessee Distillers’ Guild and assisted in the formation of the new Tennessee Whiskey Trail. In addition to his alcoholic beverage law practice, he represents clients across a wide range of industries with corporate matters and general business issues. Pinson earned his J.D. from the University of Tennessee College of Law and earned a B.A. from Oberlin College. He also holds an LL.M. in taxation from the University of Florida Levin College of Law. Atanda advises manufacturers, distributors and retailers of liquor, beer, and wine throughout the state of Tennessee. He played a key role in assisting more than 250 local and national grocery stores when legislation permitting the sale of wine in Tennessee grocery stores took effect in 2016. His experience includes beer, liquor, dance and catering licensing for restaurants, hotels, bars, clubs and resorts throughout Tennessee. Atanda earned his J.D. from the University of Tennessee College of Law and his B.A. from Tennessee State University. Faye assists clients across each tier of the alcoholic beverage industry – manufacturing, distribution and retail sales. She counsels distilleries, wineries, breweries and importers with federal and state rules and regulations regarding the advertising, marketing and sale of alcoholic beverages. Faye served for nearly five years as the senior judicial law clerk to the Honorable Frank G. Clement, Jr. of the Tennessee Court of Appeals. She earned her J.D. from the Nashville School of Law and her B.S. from Middle Tennessee State University. J. Isaac Sanders and Charles Barrett have been named members at Neal & Harwell, PLC. Sanders has been with Neal & Harwell since 2010. An experienced litigator who has tried cases in state and federal courts, Sanders graduated from Vanderbilt University Law School and earned a degree in history from Vanderbilt University. He is a mentor with the Belmont Inns of Court program, a graduate of the Young Leaders Council program and recently joined the board of directors for Youth Encouragement Services. Barrett has been of counsel at the firm since 2015. His practice focuses on personal injury, antitrust and consumer class actions, and False Claims Act claims. Barrett is a 1998 graduate of the University of Mississippi School of Law. He also earned degrees history and English from the University of Mississippi. Attorney Joshua Burgener has been elected as a new member attorney at Dickinson Wright PLLC. Burgener focuses his practice on the areas of commercial & business litigation, labor & employment litigation, class action, internal investigations and white-collar crime, and general civil litigation. He represents clients in business disputes in state and federal court and provides legal counsel on a range of topics. He is a member of the Nashville Bar Association, the Tennessee Bar Association and the American Constitution Society. He is a graduate of Vanderbilt University and his J.D. from Vanderbilt University Law School. 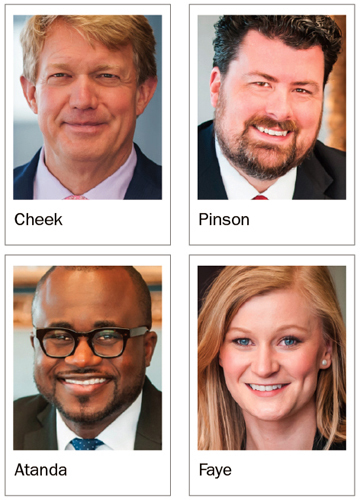 Samuel L. Jackson and Emily Harper Mack have joined the Nashville law firm of Bone McAllester Norton PLLC. Jackson and Mack have extensive experience providing quality legal representation to public and private school boards, universities and other employers. They routinely advise education clients on a wide variety of legal matters, including Title IX compliance, internal and agency investigations, administrative proceedings, special education and disability accommodations, personnel concerns, student rights and discipline, along with other legal matters that are unique to educational institutions. Jackson and Mack practiced at Lewis Thomason in Nashville before joining Bone McAllester Norton. Attorney Todd Panther, previously a partner at Tune Entrekin & White PC, has joined Sherrard Roe Voigt & Harbison as a member. A graduate of DePaul University Law School, Panther has more than 25 years of experience as a construction law attorney. He was appointed to the American Arbitration Association’s panel of construction arbitrators in 2009 and is listed as a general civil mediator by the Tennessee Supreme Court. He has served on the board of directors of the Nashville Bar Association and as chairman of the special committee of the Tennessee Bar Association that proposed wholesale revisions to the Tennessee lien law.